Big Data is all the rage. Everywhere you go, any meeting or presentation one sits through, Big Data seems to be there. But there are opportunities beyond big data. E.g. how we handle small data fast. Here’s an example of small data that I experience almost everyday. 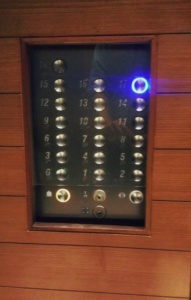 In many corporate buildings in India, you would notice that you need to punch in the desired floor into a panel, which prompts you which lift-car to hop on to. You club the waiting passengers into specific cars by their desired floors. The average wait time is lower, the average travel time to your floor is significantly lower. And all the magic happens in a jiffy. The data becomes irrelevant soon (apart from being used by the algorithm for learning and further optimization). And in a classic example of not-so-big-data. But the fact that this small set of inputs from users is taken, crunched and optimized for elevator allocation in almost real time makes it so amazing. VOLUME – Available Data size. Is it big enough to build confidence in predictive models? VELOCITY : What is the speed with which we process and move data? How fresh is the data as it moves across the value chain? This small-data use-case is very high on the data-velocity parameter and I guess just solving for data-velocity has allowed for the solution to be adopted.